THE CHAKRA DIET – Balance the Sacral Chakra and Lose Weight Too! With Thanksgiving just around the corner and pumpkin pies in the making, it’s a good time to talk about the Sacral Chakra, and the orange foods that can be used to balance this center of sexual and creative energy. Located at the lower abdomen, the second chakra, the Sacral Chakra, is the focal point of your emotions, governing how you relate to others and the flow of your feelings and creative expression. It vibrates with the energy of the color orange. If you want to balance your Sacral Chakra, and reduce cravings that lead to overeating, replace processed foods and snacks that tend to be addictive, especially as most are loaded with sugar, GMOs, hormones, antibiotics and pesticides. Instead, focus on filling, nutritious yet naturally sweet orange-colored snacks and organic whole foods, ranging from raw carrots and peppers (use them to dip in hummus or plain tahini) to yams and winter squash such as kabocha or pumpkin. Foods that are high in protein and essential fatty acids and help balance the Sacral Chakra include flax, hemp and sesame seeds, wild-caught salmon, tuna and shellfish. Fruits include oranges, peaches, apricots, mangoes and papayas. Tis the season for holiday feasts, and cooking whole foods can also increase your creativity – plan a colorful meal made with loving attention to healthy ingredients. Appreciate the beauty of the dishes you have created, breathe in their aroma, and chew them fully to savor their natural sweetness and assist in digestion. In truth, this is more satisfying than mindlessly stuffing down food to quench your pleasure center. 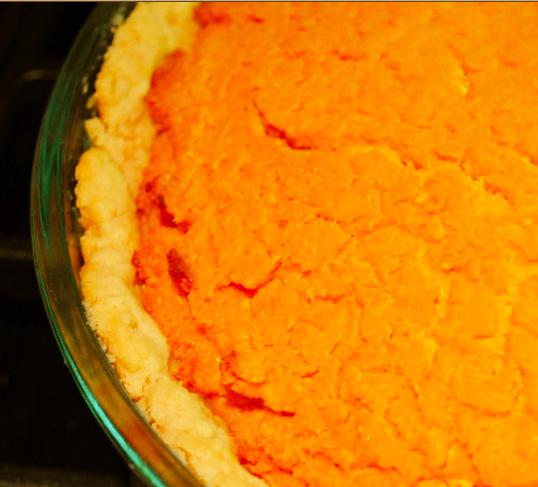 I find pies made with winter squashes such as kabocha, buttercup or butternut to be naturally much sweeter than pumpkin. My favorite is a very simple recipe learned during my training as a macrobiotic cook. Squash Pie Filling: First cut the squash in quarters, seed it and either bake or steam until soft. Peel and mash 3 cups of the bright orange flesh. Dissolve 2 T. of kuzu or arrowroot in ½ cup cold water, then heat to thicken, stirring vigorously to prevent lumps. Puree the squash with the kuzu, 2-4 T. of maple syrup, and 1 tsp. of cinnamon and/or other desired spices such as nutmeg or cloves. Nutty Oat Crust: You’ll need 1 1/3 cups oat flour (whiz rolled oats in the blender) and 2/3 cups brown rice flour. You can roast the flours to bring out their nutty taste by stirring in a skillet (cast iron ones work well). Mix in ¼ tsp. sea salt, ¼ cup chopped walnuts, 2 T. sesame or coconut oil with a fork, then add ½ to ¾ cup water (just enough to hold it together). Spread into a pie plate, then bake for 10 minutes at 350 degrees, then add the squash filling and bake for 25 minutes more. Cool and enjoy! Please share your favorite recipe for Sacral Chakra balancing – it may be included in my upcoming book THE CHAKRA DIET! The Chakra Diet – to Balance Your Root Chakra and Lose Weight Too! Located at the base of your spine, the first chakra, the Root Chakra, is the very foundation of our identity, so it’s always wise to start your Chakra Diet with attention there. This chakra is associated with basic survival and security in the world, groundedness, trust and boundaries. When we balance our chakras, we craft our lives the way we want them to be, rather than living in constant reaction to forces outside of us. These spirals of energy are wheels that heal, feeding the body good energy and profoundly affecting our metabolism, as well as emotions, sensations and behaviors. The way we handle stress depends on our chakra balance… and we can eat our way into balance with healthy whole foods (unhealthy processed foods just cause the body more stress). 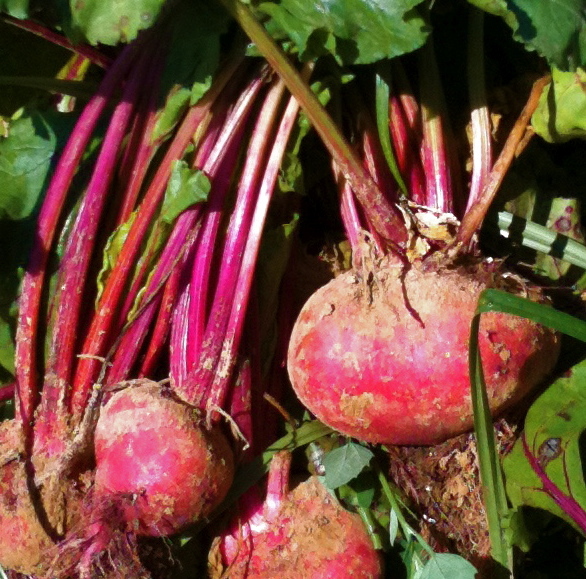 Two of my favorite recipes for the Root Chakra are for Borscht (beet soup), Turkey and Bean Chili. Get a complete list of foods, recipes, yoga poses, and meditations for each chakra… in The Chakra Energy Diet, available now on Amazon Kindle. Leading Chakra Workshops came out of my work doing Yoga Health Retreats in Hawaii, starting 10 years ago. At the end of every yoga class, we would finish with a chakra meditation. Often, after class, my students would want to discuss specific problems in their lives that were clearly related to one chakra or another. So, in addition to using chakra meditations in my yoga classes, I decided to try 8-week chakra workshops for local students. Each week, we would focus on balancing one of the chakras, starting with the root chakra, using guided visualizations, yoga poses, toning, color therapy and crystal healing. The final week would be an integrative, sharing session. During the last year I have concentrated not on teaching, but on my writing, both as a novelist with The Chakra Diaries and as a journalist on holistic health issues. The best part about my yoga practice is that it gives me a reservoir of calm and strength from which to face the tight deadlines and stresses of my day. I have been known to walk away from my computer to do yoga poses to stretch and relax, and usually my coworkers follow me to join in. Once, during a long plane ride, while waiting in a never-ending line for the rest room, I began doing a few standing poses. The two businessmen behind me asked what I was doing and if I could show them how to do the poses also. It turned into an informal yoga class in the aisle of United Airlines. In teaching, whether in a formal class or a funny moment like on the plane, I love sharing what I have learned. I believe we’re all wounded healers on this earth, here to help each other. “The mind-body system has almost unlimited self repair capabilities and any positive physical, emotional, and mental behavior will enhance a person’s self healing abilities,” said Serge Kahili King, PhD, Huna philosopher, teacher and author. I encourage you to try stress reduction through yoga, meditation, chakra balancing… whatever works for you. And use your intuition to guide you to the right person to help you move toward positive change in your health and in your life.